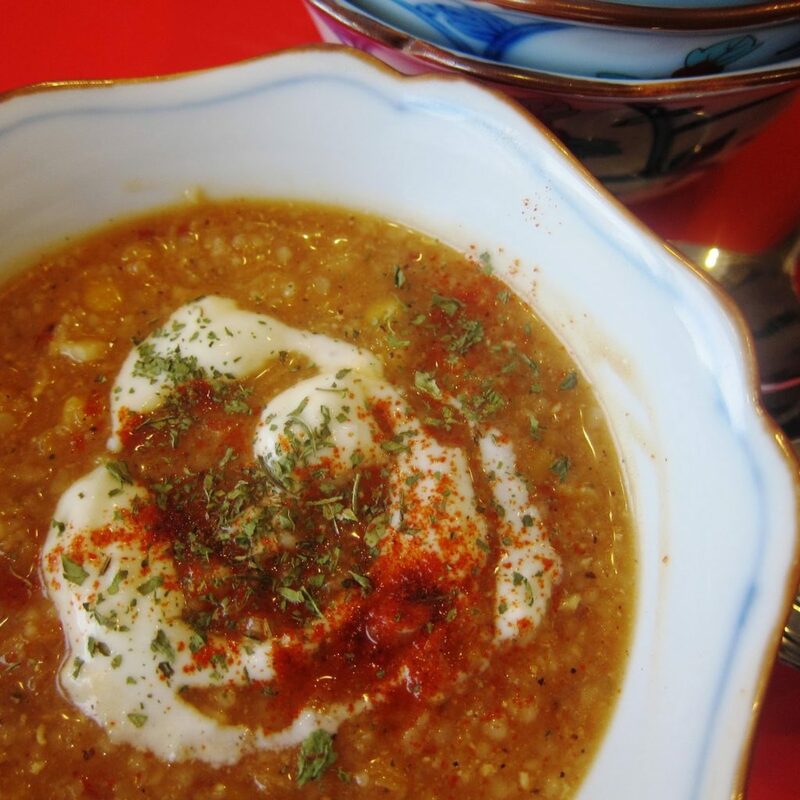 Acem Çorbası/Persian Soup: Another Hearty Soup for You! 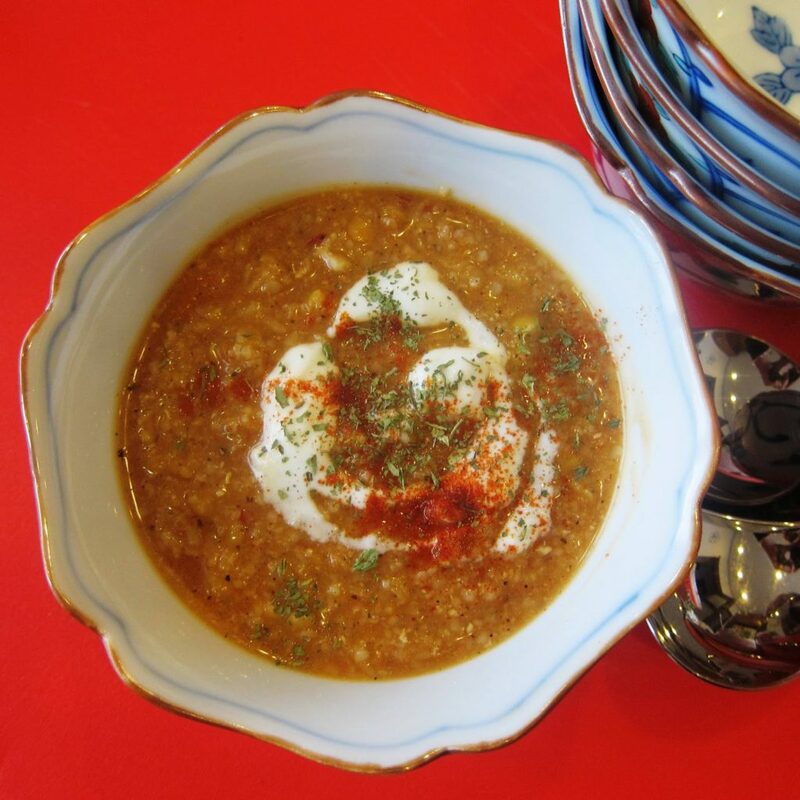 I really don’t know why it’s called Persian Soup but to me the name conjures up images of turbanned merchants travelling a long,hard road with perhaps this soup being prepared by their long-suffering women to give them warming sustenance along the way. The weather all over the country right now is wet and wild: days just right for this type of soup. 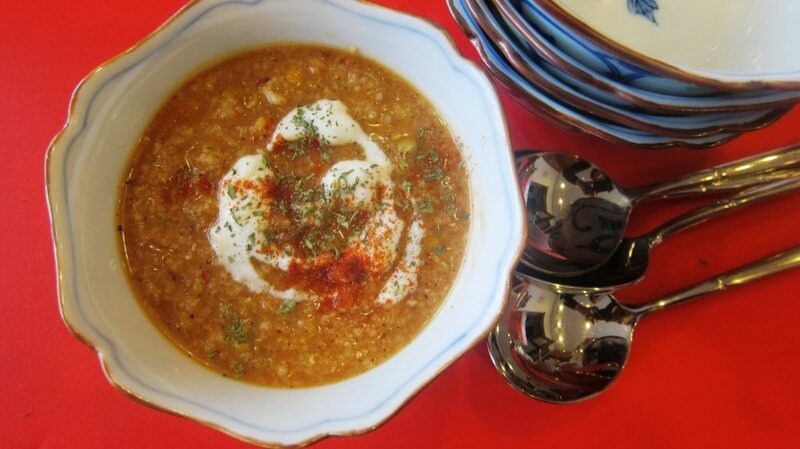 I am loving my new soup book Çorbanın Kitabı by Ebru Omurcalı as most of the Turkish soups are all variations on a very familiar theme so no running out for unusual ingredients! Thank you, Nancy H, for such a thoughtful gift! What makes this soup different? Well, first of all, there is no onion, and secondly it contains yogurt and also the more unusual spice, that wonderful Mediterranean purple sumac. Delicious! nutritious! warming! here we have Persian soup! However, there is one thing that I will say because it has now happened. Invariably there is a fatal flaw in these Turkish recipes: either the number of servings is missing, or what temperature or how long a dish should be cooked. Sooner or later you come up against this. Or else the instructions are just not clear with a lot of things being assumed. This is what happened here plus the photo is downright misleading. It looks like a thick tomato soup garnished with a grilled green pepper. All it takes is a quick skim through the ingredients and you will see there is no tomato and not even tomato paste listed there! I think this photo got in there by mistake. You would never expect a bright green pepper garnish in a soup based on pulses, would you? On the other hand, this particular book has a decent index which is surprising: in my experience, you have to go through a huge culinary detour to find whatever recipe you are looking for as the idea of logical categories combined with dishes listed in alphabetical order just doesn’t seem to happen! Wash and drain the lentils and the bulgur. Place in a saucepan with the 8 cups water. Boil until soft. TIP I suggest bringing the water to the boil and then adding the lentils and bulgur. Melt the butter in a separate frying pan and add the peeled and sliced garlic. Cook until soft. Add the pepper paste and spices and cook for a little more. Add this mixture to the cooked lentil and bulgur mixture. Whisk the yogurt and gently add 1 spoonful of the hot soup mixture. Stir well and then add the whole to the soup pan. Serve with a swirl of yogurt and a sprinkling of dried mint and extra red pepper flakes if desired. If the wind is howling and the rain is pouring down, then this is the soup for you! PS It is one of those soups that benefits from waiting a bit for the tastes to develop .